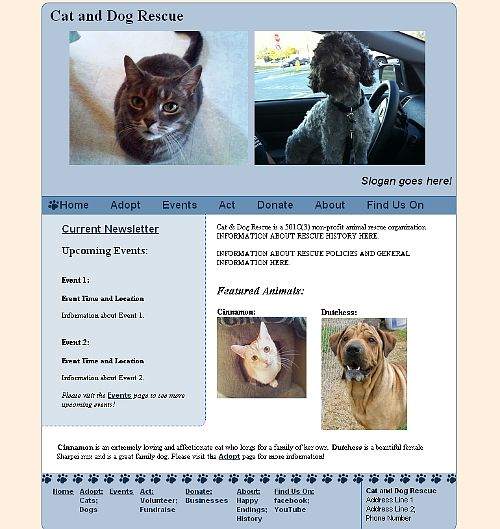 This is a sample website design I created for a local rescue group. Jackson Ferrell created the paw-print images. My basic goal was to focus the website on the animals by having the slideshows in the header showcase each and every animal available for adoption. The index page includes a link to the Current Newsletter to make it easy to find and a snapshot of the Upcoming Events that are happening soonest and also includes photos and a brief description of the Featured Animals. This is information that people who would visit the website regularly would want to have easy access to. Unfortunately, the group decided on another direction. The cats in the slideshow on the sample page are my cats.